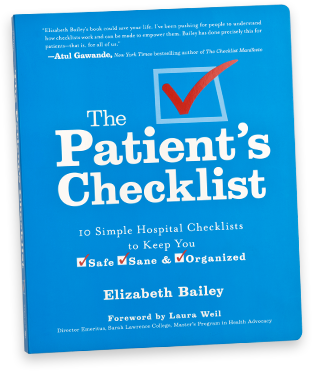 The Patient's Checklist | ExpressWell, Inc.
We are so excited for Elizabeth Bailey’s book, The Patient’s Checklist! It’s a must-have book that can save your life with its simple and insightful approach. While helping family and friends navigate their hospitalizations, [Bailey] realized how production checklists could be adapted to help patients better manage the complexities of hospital care. Pick up a copy today, and tell your friends about it; you never know when you’ll need it.